Marantz has introduced its first 13-channel AV pre-amplifier to an ever-growing range of audio solutions for the home technology market. Distributed via AWE - and available to experience within the AWE THX cinema room in Epson - the Marantz AV8805 perfectly handles all high-resolution audio formats and produces exceptional music and movie playback. Delivering crystal clear sound, Marantz’s first 13.2 channel home theatre pre-amplifier is equally adept at delivering full 4K Ultra HD surround sound in a home cinema environment, as well as performing as a key component of a wireless multi-room audio system – thanks to wireless connectivity via Wi-Fi and Bluetooth. With HEOS integration inbuilt, the AV8805 can be linked to HEOS products for a complete home audio setup, featuring speakers, soundbars and subwoofers. Music streaming is available through Spotify, TuneIn Internet radio, JUKE, TIDAL, Napster, Deezer, Apple AirPlay, Soundcloud and Amazon Prime Music. A future firmware update means that the pre-amplifier will also features Amazon’s Alexa Smart Home Skill for Entertainment Devices, enabling homeowners to use voice commands to switch inputs, adjust volume, skip a song and more. This feature ensures the AV8805 can be integrated as a flexible home cinema product. The Marantz AV8805 is Ideal for the custom integrator, featuring a balanced XLR stereo input and assignable 15.2 balanced XLR outputs, which include overhead channels, front/width outputs and two subwoofer outputs. The extensive balanced XLR compatibility ensures high-end performance in a residential setting, while 15.2 RCA pre-outs provide additional compatibility with multiple power amplifier types or active speakers. 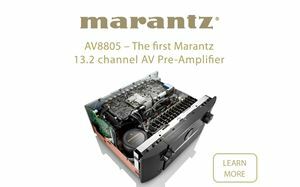 The AV8805 further enhances audio quality by carefully handling all signals via the Marantz HDAM modules in Current Feedback topology, before passing to the XLR or RCA outputs and separate power amp. The AV8805 also features an advanced video section, with full 4K compatibility that's fully compliant with the latest HDMI connectivity and HDCP 2.2 specifications on all eight HDMI inputs. It also comes with enhanced audio return channel (eARC) support (via a firmware update) for the most advanced audio formats via single HDMI connection between the device and compatible TVs. The highly rigid base chassis leaves no chance for microphonic effects through unwanted vibration. The oversized toroidal transformer feeding the big main capacitors is set on an extra 5mm aluminium pedestal for extra stability. All the electronics are supported by the copper plating on the main chassis, which guarantees the best ground connection at any point, and significantly improves Signal to Noise behaviour. In total, 17 single board HDAM modules are used to achieve the best channel separation for reference-setting audio performance. Finally, everything is well covered by a heavy top lid constructed out of three pieces. The AV8805 now features within the original AWE THX cinema room, providing a perfect demonstration facility within the AWE Show Apartment. The cinema room boasts a KEF 7.5.4 THX speaker configuration, achieving a full Dolby Atmos/DTS:X experience. For more information, visit www.awe-europe.com call +44(0)1372 729 995 or email [email protected].